This page is about the United States national park. For Kings Canyon in Australia, see Kings Canyon (Northern Territory). Kings Canyon National Park is a national park in the southern Sierra Nevada, east of Fresno, California. The park was established in 1940 and covers 461,901 acres (721.720 sq mi; 186,925 ha; 1,869.25 km2). It incorporated General Grant National Park, established in 1890 to protect the General Grant Grove of giant sequoias. The park is north of and contiguous with Sequoia National Park; the two are administered by the National Park Service jointly as the Sequoia and Kings Canyon National Parks. They were designated the UNESCO Sequoia-Kings Canyon Biosphere Reserve in 1976. Humans have inhabited the area for thousands of years. The first Native Americans in the area were Paiute peoples, who moved into the region from their ancestral home east of Mono Lake. The Paiute Nation people used deer and other small animals for food, as well as acorns. They created trade routes that extended down the eastern slope of the Sierra into the Owens Valley. Kings Canyon had been known to white settlers since the mid-19th century, but it was not until John Muir first visited in 1873 that the canyon began receiving attention. Muir was delighted at the canyon's similarity to Yosemite Valley, as it reinforced his theory regarding the origin of both valleys, which, though competing with Josiah Whitney's then-accepted theory that the spectacular mountain valleys were formed by earthquake action, Muir's theory later proved correct: that both valleys were carved by massive glaciers during the last Ice Age. 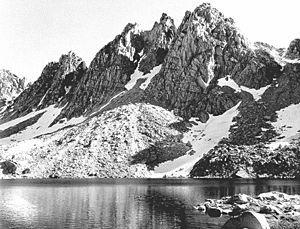 Then United States Secretary of the Interior Harold Ickes fought to create the Kings Canyon National Park. He hired Ansel Adams to photograph and document this among other parks, in great part leading to the passage of the bill in March 1940. The bill combined the General Grant Grove with the backcountry beyond Zumwalt Meadow. Kings Canyon's future was in doubt for nearly fifty years. Some wanted to build a dam at the western end of the valley, while others wanted to preserve it as a park. The debate was settled in 1965, when the valley, along with Tehipite Valley, was added to the park. Kings Canyon National Park consists of two sections. The small, detached General Grant Grove section preserves several groves of giant sequoias, including the General Grant Grove, with the famous General Grant Tree, and the Redwood Mountain Grove, which is the largest remaining natural grove of giant sequoias in the world covering 3,100 acres (1,300 ha) and with 15,800 sequoia trees over 1 foot (30 cm) in diameter at their bases). The park's Giant Sequoia forests are part of 202,430 acres (81,920 ha) of old-growth forests shared by Sequoia and Kings Canyon National Parks. This section of the park is mostly mixed conifer forest, and is readily accessible via paved highways. 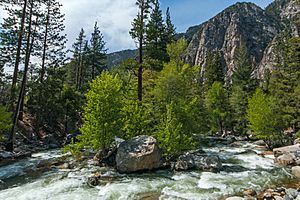 The remainder of Kings Canyon National Park, which comprises over 90% of the total area of the park, is located to the east of General Grant Grove and forms the headwaters of the South and Middle Forks of the Kings River and the South Fork of the San Joaquin River. Both the South and Middle Forks of the Kings Rivers have extensive glacial canyons. One portion of the South Fork canyon, known as the Kings Canyon, gives the entire park its name. Kings Canyon, with a maximum depth of 8,200 feet (2,500 m), is one of the deepest canyons in the United States. The canyon was carved by glaciers out of granite. The Kings Canyon, and its developed area, Cedar Grove, is the only portion of the main part of the park that is accessible by motor vehicle. Both the Kings Canyon and its Middle Fork twin, Tehipite Valley, are deeply incised, U-shaped glacial gorges with relatively flat floors and towering granite cliffs thousands of feet high. In addition, the canyon has several cave systems, one of which is Boyden Cave, open to the public in adjacent Giant Sequoia National Monument. To the east of the canyons are the high peaks of the Sierra Crest, which attain an elevation of 14,248 feet (4,343 m)NAVD 88 at the summit of North Palisade, the highest point in the park. 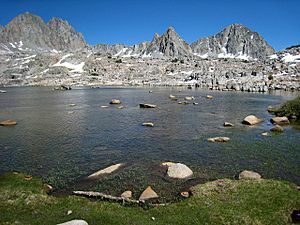 This is classic high Sierra country: barren alpine ridges and glacially scoured lake-filled basins. Usually snow free only from late June until late October, the high country is accessible only via foot and horse trails. The Sierran crest forms the eastern boundary of the park, from Mount Goethe in the north, down to Junction Peak, at the boundary with Sequoia National Park. Several passes cross the crest into the park, including Bishop Pass, Taboose Pass, Sawmill Pass, and Kearsarge Pass. All of these passes are above 11,000 feet (3,400 m) elevation. Kings Canyon is a wide glacial valley featuring tall cliffs, a meandering river, green vibrant meadows and waterfalls. A few miles outside the park, Kings Canyon deepens and steepens becoming arguably the deepest canyon in North America for a short distance. The confluence of the lies at 2,260 feet (690 m), while towering above the rivers on the north side of the canyon is Spanish Peak, which is 10,051 feet (3,064 m) tall. Most of the mountains and canyons in the Sierra Nevada are formed in granitic rocks. These rocks, such as granite, diorite and monzonite, formed when molten rock cooled far beneath the surface of the earth. The molten rock was a by-product of a geologic process known as subduction. Powerful forces in the earth forced the landmass under the waters of the Pacific Ocean beneath and below an advancing North American Continent. Super-hot water driven from the subducting ocean floor migrated upward and melted rock as it went. This process took place during the Cretaceous Period, 100 million years ago. Granitic rocks have speckled salt and pepper appearance because they contain various minerals including quartz, feldspars and micas. Roaring river in the King's Canyon National Park. While geologists debate the details, it is clear that the Sierra Nevada is a young mountain range, probably not more than 10 million years old. Incredible forces in the earth, probably associated with the development of the Great Basin, forced the mountains to grow and climb toward the sky. During the 10 million years at least four periods of glacial advance have coated the mountains in a thick mantle of ice. Glaciers form and develop during long periods of cool and wet weather. Glaciers move through the mountains like slow-motion rivers carving deep valleys and craggy peaks. The extensive history of glaciation within the range and the erosion resistant nature of the granitic rocks that make up most of the Sierra Nevada have together created a landscape of hanging valleys, waterfalls, craggy peaks, alpine lakes and glacial canyons. Year-round and seasonal residential animals of this park include the chickaree, gray squirrel, golden-mantled ground squirrel, mule deer, gray fox, black bear, cougar, and migratory and a variety of resident birds (western tanager, violet-green swallow, white-throated swift, Wilson's warbler, olive-sided flycatcher, hermit thrush, western bluebird, and pileated woodpecker). Mammals are less common here, especially bighorn sheep. Other mammals include the coyote, badger, marmot, pika, marten, red fox, and white-tailed jackrabbit. Birds include the Clark's nutcracker, mountain bluebird, and gray-crowned rosy finch. Sequoia and Kings Canyon National Parks campgrounds are located in oak woodlands in the warm, dry foothills and in the higher, cooler conifer forests. They range in elevation from 2,100 to 7,500 feet (640 to 2,290 m). Lodgepole, Dorst, Grant Grove and Atwell Mill campgrounds are near giant sequoia groves. In general, higher elevation campgrounds are cooler and closer to giant sequoias. Snow blankets Sequoia and Kings Canyon National Park from November until April or May. During these months, cross-country skiing and snowshoeing are popular. Knapp's Cabin is an attraction in Cedar Grove. George Knapp was a wealthy business man in California who chose a spot to build his cabin to use as a storage shed for all of the summer camping trips he would take during the 1920s. It is now the oldest building in Cedar Grove. A mile from Knapp’s Cabin is Roaring River Falls, accompanied by a variety of wildflowers in the area and also a variety of birdlife. Hume Lake can be found about eight miles north of Grant’s Grove, and was originally a reservoir built in 1908 to provide water for logging flumes. The lake is enjoyed by hikers and canoers. Kings Canyon National Park Facts for Kids. Kiddle Encyclopedia.